Next time you're in the mood for a chocolate fix, consider ingesting it through your nose. 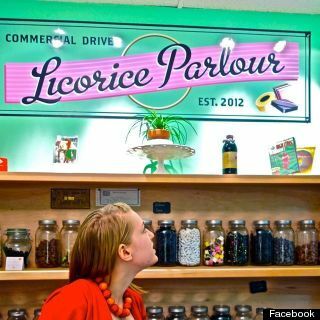 In an apparent first for Canada, Vancouver's Commercial Drive Licorice Parlour is now offering chocolate snorting. Owner Mary Jean Dunsdon says a friend mentioned to her about a year ago that he had snorted chocolate in Amsterdam. "I just couldn't believe what I was hearing," she told The Huffington Post B.C. Obsessed with the idea, which originated in Belgium, she travelled to The Chocolate Line store in Antwerp, and bought the tools (oh yes, there are tools). The cocoa powder comes in a box kit, complete with instructions and a plastic "catapult" apparatus that launches the powder into the nostril. "The chocolate goes up your nose and settles into your sinuses and oral factory where most of your tasting happens," Dunsdon explained. The tool never actually touches the nostril, but rather distributes the powder through the air and into the nose. "Then you just kind of experience chocolate for a couple hours, actually, in a very subtle manner," she says. "It hits all the same pleasure receptors in the brain [as it would] if you were to eat chocolate." Dunsdon sells individual sniffs for $2 each; keeners can buy their own tin to take home for $12, or purchase the entire kit for $109. There are two flavours to choose from: cocoa raspberry and cocoa ginger; both also have a hint of mint. Since launching the service in November, Dunsdon says about 60 customers have tried it — including a slew of eager students from the nearby high school. She thinks the novelty is what draws people in, but mentions that some customers say the snorting actually helps clear their sinuses. But of course, everything in moderation. Dunsdon says only about an eighth of a teaspoon goes into each snort, and that "you don't want to do that much." The phenomenon began when Belgian chocolatier Dominique Persoone was asked to create something fun for a Rolling Stones birthday party. But now everyone nose about it.